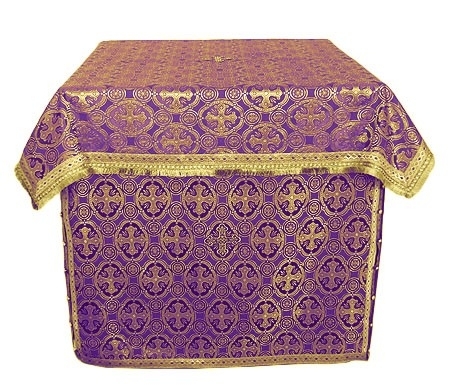 Orthodox Church liturgical Oblation table vestments (violet-gold) by Istok Church Supplies Corp. In search of a beautifully handmade violet-gold Oblation Table vestment? You’ve come to the right place! On this page, you’ll find exquisite violet-gold Oblation Table vestments that come with the same guarantee of quality fabric, workmanship and affordable pricing that are the hallmarks of all our other church vestments. The Divine Liturgy is one of the most important services held in an Orthodox Church. Blessed are the people who witness it and blessed are the people who help conduct it. We understand there’s a lot of elaborate symbolism and meaningful rituals associated with the preparation of the bread and wine on the Oblation Table. Our violet-gold Oblation Table vestments are created to enhance the spiritual ambience and set the tone for the proceedings. Made from luxurious church silks and brocades, our violet-gold Oblation Table vestments are a sight to behold. They include not just the top cover but also side drops. Decoration in the form of fringes and galloon add to their aesthetic appeal. Here, we would like to mention that customers can opt for premium decoration and velvet inserts by paying a small additional price. Durable and attractive, each one of the Oblation Table vestments offered by Istok Church Supplies offers best value for money. To take our service to the next level, we offer made-to-measure solutions. Now you can shop online from the comfort of your home and procure a perfectly fitting Oblation Table vestments created to your exact measurement specifications. Our skilled and experienced ecclesiastical tailors in Europe are more than capable of putting together your order in a matter of weeks. We also offer rush services with applicable charges for customers who need quicker delivery. Select from our wide range of Oblation Table vestments, place your order online and pay using secure payment channels. We will take care of the rest!